At the beginning of September, in corporation with their valuable customer DCP Airports, Blastrac renovated the runway of Poitiers airport. Blastrac shot blasting machines are extremely suitable for the maintenance of the runways. Blastrac closed circuit blasting machines throw the abrasives by centrifugal force on the surface. The abrasive media is recycled within the machine and all dust and contaminants are removed by an air wash separator. The dust and contaminants are removed to a dedicated Blastrac dust collector which makes the process almost dust-free in operation. 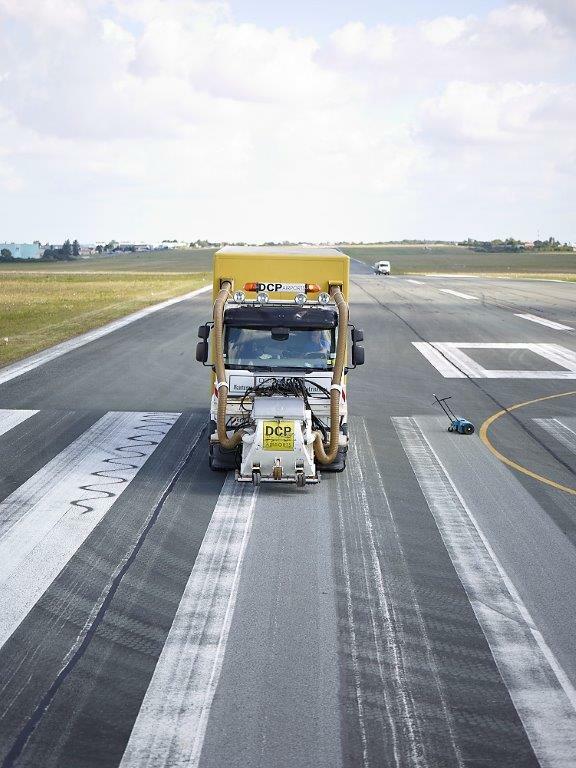 Our truck mounted shot blaster, the 2-45DTM, carried out the removal of rubber and the removal of old marking lines on the main runway of the airport. The surface had not been renovated for 10 years. Hence why the runway needed to be cleaned, in order to get the grip back. Moreover, the marking lines were old and worn and they needed to be repainted. Our 2-45DTM also removed the lines before the application of new paint. Our 2-45DTM is the best possible and most cost effective and efficient solution to regenerate the macro and micro texture of runway surfaces. Because of its high performance and reliability, it is possible to treat a surface of up to 3000 m² per hour on runways. Blastrac would like to congratulate DCP Airports for this fantastic job. If you would like to receive more information about this project or what Blastrac can do for you, please contact us today!